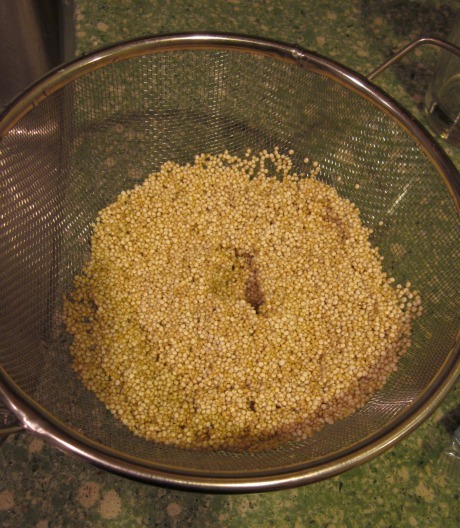 Home » Home Cooking » FAQ: What is Quinoa? What it is: Quinoa is actually a seed of a leafy plant, but it is usually treated as a grain (I use it as a side dish, for example). It’s naturally high in protein, fiber, iron and magnesium, and it’s easy to digest. You cook it just like rice, and it comes out fluffy with a slight crunch. It’s pronounced keen-wah, by the way. 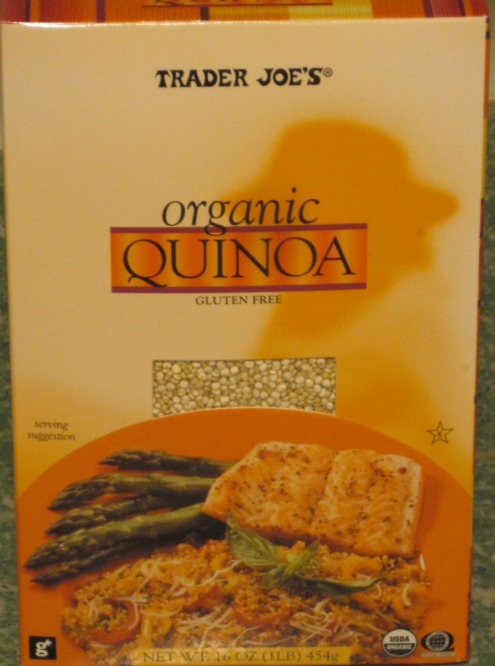 Where to buy it: I usually buy it at Trader Joe’s, where I’ve seen both standard quinoa and red quinoa. It’s become a little more popular in recent years and may appear at your regular grocery store (I’ve seen it at Giant here in NoVA, in the health food aisle), otherwise try Whole Foods or a health food store. You can also buy it at Amazon . 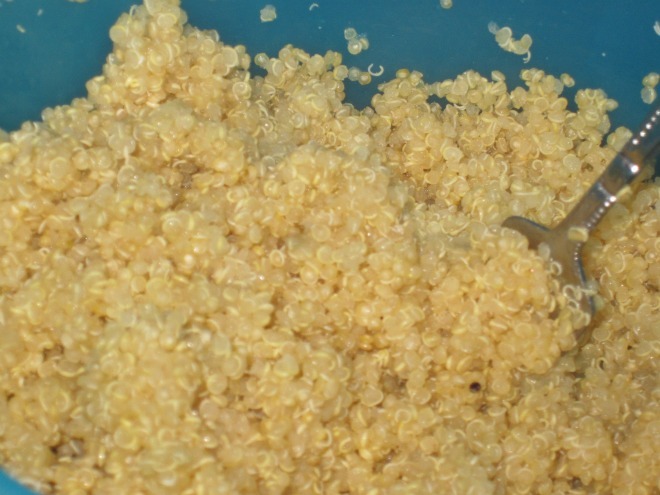 How to prepare it: Quinoa can have a bitter-tasting coating, so most packaging will suggest you rinse it before cooking. I bought a colander with very tiny holes for rinsing. Then, similar to rice, you use a 1:2 ratio with water. For extra flavor, you can use chicken or vegetable broth. 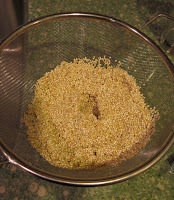 Boil the water/broth, add the quinoa, and cover and simmer for about 15 minutes; it will look translucent. Once done, fluff with a fork. It can also be cooked in a rice cooker, following the directions for white rice. One thing I’ve learned, though, is that quinoa doesn’t keep its texture when mixed with liquidy sauces. I tried tosubstitute it for pasta in my Spinach Pasta Salad, and it soaked up the dressing and came out mushy. Why we like it: It’s different! Everyone gets tired of the same old rice and pasta. This gives you a new texture and flavor to add to meals. 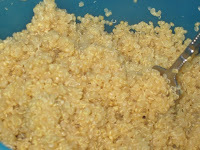 Kids get a kick out of the red quinoa, too, since it’s pretty unusual looking. I like it because it’s so nutritious and healthier for us than pasta. Have you tried quinoa? What recipes do you like?